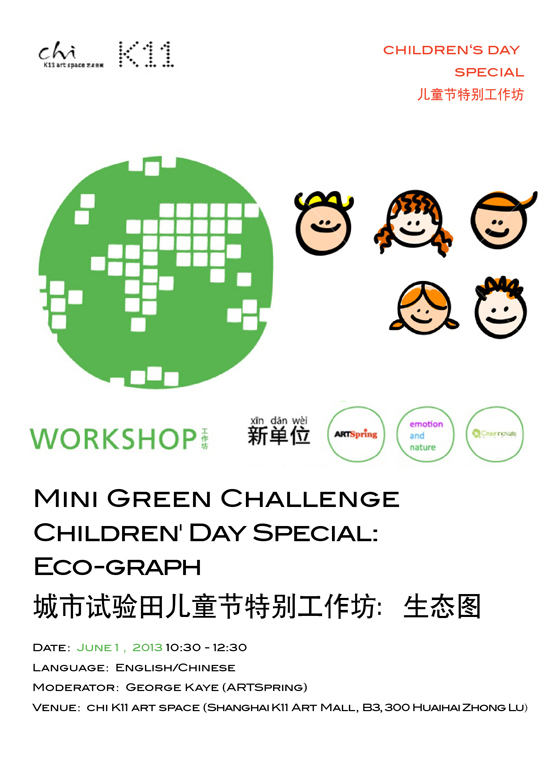 “Eco-graphs” is a fun art activity in which children create a personal symbol for eco-values using Chinese brush and ink on paper. What exactly are our values with respect to nature? Through a straightforward design methodology this question is explored verbally and visually. Each symbol that emerges is unique, but they all share a visual language that connects them to the earliest forms of human writing. The workshop includes a demonstration and discussion with several professional artists and calligraphers. No experience in art or calligraphy necessary. Cities need a healthy regenerative supply of resources and goods that ensures food, water and energy security. Mini Green Challenge is a call to action for everyone living in the city to raise awareness about conscious living, informed consumption, and the collective impact of individual actions. Our goal is to inspire urban youth and familes to transition from conventional to conscious living, take action, and sustain a healthy, just planet. Mini Green Challenge designs creative participatory learning environments for game-changing conversations. This project will demonstrate an innovative, community-focused actions toward a sustainable way of living. 5 Mini Challenges will be brought to the public by: Artists, Educators and Green Movement Advocates. Mini Green Challenge is brought to you by Xindanwei. Meet Xindanwei, a Shanghai based international open innovation program in experiential and radical learning for organization, startup and strategy development. We design and deliver creative participatory learning environments and experiences for game-changing conversations and disruptive solutions, and connect the participants with the movers and shakers of China’s creative, technology and social innovation scene. We challenge participants to leave their comfort zones, harness individual and collective creativity to evolve and innovate. The outcome is inspiration, transformation, confidence, ownership and next individual and organizational endeavor. This isn’t just about generating ideas. It’s also about making the ideas happen. The co-working community we serve and work with is a self-nourishing network embedded in China’s creative, tech and social sectors which provides community members with the opportunity to seek out resonated spirits and share in rich discussions about creativity, entrepreneurship, innovation and impact to the society.